Romaine Electric Corporation takes great pride in providing premium quality products. Search the listings for product details and links to OEM and aftermarket partners. The loyalty and confidence of our customers have empowered Romaine Electric as a leader in the aftermarket supplier provide the absolute best products and service available. Dare to compare our high quality professional services with the competition. - A FULL LINE supplier for OEM and AFTERMARKET units,parts, components, and accessories .... Both NEW and RE-MANUFACTURED. - One of the LARGEST custom armature/rotor rewinding facility in the Unites States. - Custom unit re-manufacturing and repair. - Complete machine shop capabilities. - Latest technology implemented for error free order verification and shipping. - 90,000+ part numbers in stock. - Complete, easy access online ordering system featuring application and parts lookup, real-time availability inventory and price, cross- reference information, pictures, current A/R figures, buyer’s guides, and more...all for FREE! - One of the best and most extensive technical knowledge networks. - Professional, competent, friendly customer service staff with well over 200+ years combined experience. - Same day shipping on orders received by 4:30PM PST from the Kent, Washington location. Times vary by location. Romaine Electric Corporation takes great pride in providing a premium quality remanufactured unit. All efforts are made to improve on inherent OEM design flaws associated with high failure rates. 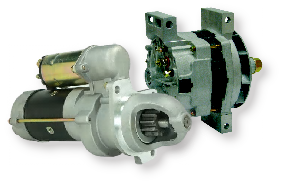 On both starters and alternators all brushes, bearings, bushings, starter drives, solenoids, armatures and rotors are either replaced with new or remanufactured parts rather than salvaged. As a reminder we can assure armature and rotor quality as well as timely availability. As a notional parts supplier, we are also able to consistently acquire the highest quality sub-components. Click on one of our partners for more information.